Global cloud company Infor has partnered with non-profit organisation, Habitat for Humanity, to help launch Habitat Hand-up Christchurch. Together with Crusaders volunteers and players alike, Infor employees and the Christchurch community have in the past month been rolling up their sleeves for the rebuild in Bromley. Earlier this week, following 30 days of hard graft, members of the Bromley community and many involved in the project build gathered to celebrate the progress of the project to date. The $7.6m project involves the construction of 21 homes to re-house families in need following the devastating earthquakes of 2010 and 2011 which destroyed 20,000 homes. Habitat Hand-up Christchurch will see families housed in decent homes, eliminating the health issues faced in their current houses and putting them on the path to home ownership over a ten-year period. “Habitat partner families are struggling with living in sub-standard living conditions which adversely affect their health and education,” says Peter Taylor, General Manager, Habitat for Humanity Christchurch. Volunteers from Infor, the Crusaders and the Christchurch community have been hard at work at Bayswater Crescent, building 11 of the project homes. With construction now well-advanced, the first six homes are scheduled to be occupied by July. “This partnership reflects our continued commitment to being actively involved in the future of Christchurch and the wider Canterbury region,” says Jo-Anne Ruhl, Managing Director, Infor Pacific. “Infor is now in its third year of a corporate sponsorship partnership with Habitat for Humanity International, which has seen the business donate upwards of US$500k to date. “Working with an organisation such as the Habitat for Humanity is important as we are always on the lookout for synergies in partnerships that extends to local businesses and communities. 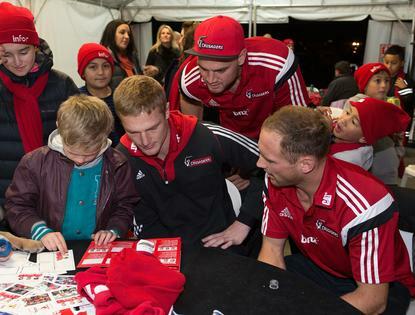 According to Crusaders CEO Hamish Riach, it’s great for the club to be involved in a project where the direct benefits to the community and to the families involved are so clear to see. Families selected in the project build were those who have been severely affected by the housing crisis that resulted from the Canterbury earthquakes. At present, their current rental housing is sub-standard, with many of the family members suffering from respiratory disorders directly caused by poor-quality housing.